Flint is a framework to facilitate a configurable file/format validation. Its underlying architecture is based on the idea that file/format validation almost always has a specific use-case with concrete requirements that may differ from a validation against the official industry standard of a given format. In order to match such requirements Flint was developed. 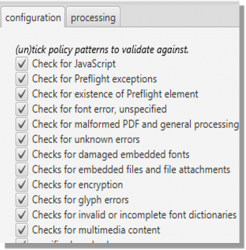 Flint allows you to determine your own institutional policy and identify files that fall outside it, for example PDFs with missing embedded fonts, or files that are not valid. The approach taken is that it is better to aggregate information from several sources, so the PDF and EPUB modules reuse several external programs and libraries including: Apache Tika, Apache PDFBox, IDPF EpubCheck, Jhove, Calibre and iText. The core module provides an interface for new format-specific implementations, which makes it easy to write a new module to add other file formats as well. A Hadoop MapReduce module (flint-hadoop). Encapsulates external libraries API’s in wrappers to isolate complexity from the main program and facilitate reuse. 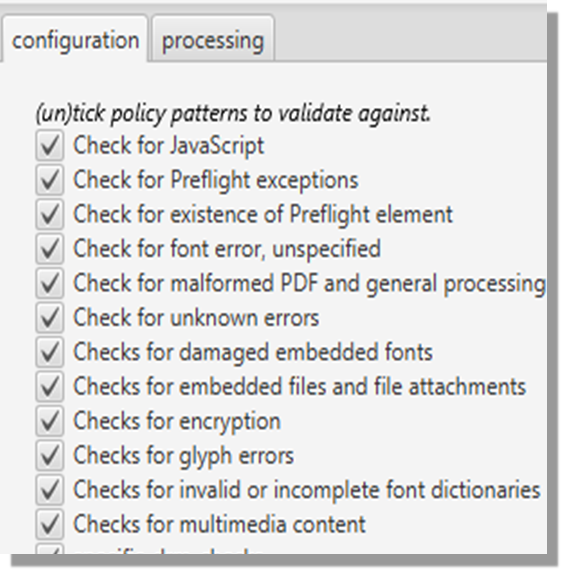 Policy is kept in configuration files, separate from code.